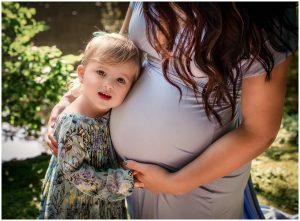 If you’re expecting a new addition to your family, highlight your beautiful nine-month journey through pregnancy by booking a maternity photography session. A maternity shoot lets you capture the joy that you feel as you anticipate Little One’s arrival and show off your radiant pregnancy glow. This stage is short yet monumental for your family, so it’s well worth documenting. When you look at the photos below, you can see that studio sessions provide a dramatic, stylistic element that’s hard to get outside. Outdoor photos are beautiful, but if you’re looking for something striking and glamorous, a studio session is the way to go. I offer a variety of backdrops, sets, colors, and themes to help you capture the exact look you are going for. The dark backdrop in these photos really showcases this beautiful mama-to-be’s facial features and expressions while perfectly accentuating her baby bump. Captivating is an understatement! Speaking of sheer and lacy, if you’re including a couple different looks, the studio offers privacy and convenience for wardrobe changes during the session. No trying to find a restroom or wiggling into a dress in the car. Simply hang your dresses in the changing area, and it’s right there when you’re ready. At the studio, book your maternity session at any time of year, rain or shine. It’s a little harder to reschedule a maternity session – no waiting a few months until summer – and we have a shorter window to work with. A studio session allows you to book on your timeline and feel comfortable whether it’s snowing or 100 degrees outside! If you would like to book a custom maternity photography session, contact me today. Due to high demand, I only photograph maternity sessions for parents that schedule a newborn photography session with me.